those are absolutely adorable. great birthday suprise for you!!! Love the tutorial! I posted about it over at whipup. Your tiny pin cushions are ADORABLE! I want to use your idea to make a really tiny pin cushion, include a tiny rubber band of some sort to create a pin cushion ring that I can wear on one of my fingers; or maybe a not-so-tiny pin cushion that you can wear around your wrist ... hmmm! now you are giving me great ideas! You are such an inspiration! Love to you and yours. keep pin cushions far away from pets at all times. A few weeks ago, I stopped what I was working on for 20 minutes to make dinner, sat the cushion on the table, and spent the night in the puppy ER. We're all ok now, and I'm 500% more careful now than I was before! so cute! but i'm craving sweets just now, i might eat them, they look so yummy. perfect for travelling. Here's another tutorial - I've been wanting to make some; saved a bunch of bottle caps (a year ago!). I love these. I have made them using babyfood jars and then you have a place to put extra pins or to take it with you without them falling everywhere. Thank you for the tutorial, I had forgotten how much I loved making these. I love all of your tutorials. I've been blog-hopping and came across your lovely blog. I love your blog. I would love to put it on my google homepage, but my computer skills lack skill! The tiny pin cushions are definitely on my to do list. love this! but might suggest you put a heavy washer or nut from the hardware in the bottom before adding the stuffed top. that will keep it weighted and steady on the table. thanks again for the inspirations! Charlotte, you're a genius. That's a great idea. This is so adorable---thanks for a great blog!!! you make it look so simple! they're adorable. Thankyou so much for showing how to make these, they're super cute! Thank you for the tutorial (you can view my first one here), and just wanted to say I really enjoy reading your blog! I just love the pin cushion. Your blog is great too, an inspiration for me to keep improving mine. Thanks for the tutorial. I just wanted to thank you for this great how-to. 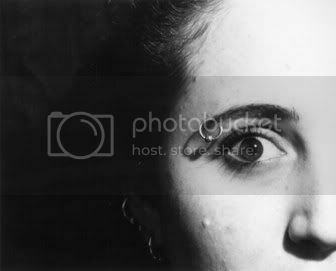 I have added a link to your blog from mine. Nice to see someone linked me! try my main collection for both all my pincushions and my tutorials. Mine varies in that I cover the entire cap, just hide it away. holy easy and TOTALLY cute! So cute, I can't wait to try one myself! So cute!! I love when I see a tutorial and I actually have all the supplies on hand! I didn't realize how many pin cushion tutorials were out there! Mine is very similar to yours but I attach an elastic so you can wear it on your finger. Yours is much quicker and with Christmas almost here I think I'm going to make some :) Thanks for the great tutorial! Your finger elastic is a great addition! This is delightful, I can't wait to make one for my dd 11, thank you so much, your site is lovely!! hey i just made TWO of these! so easy and quick! 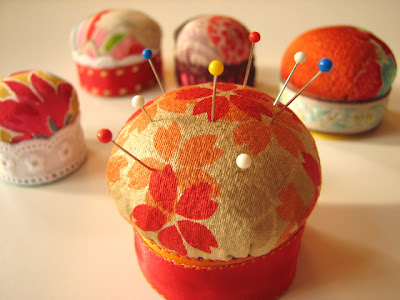 You could come up with so many variations of your pincushion. It is amazing. The wool one is really neat. Thanks for sharing - lovely! I just made two of these, too! I made one that is a ring (that elastic-- a great idea!) and one that goes on the wrist. For the wrist one, I just found a wide piece of fabric (at least almost as wide as the bottle cap) as long as fits around your wrist. Then I put a button on one end and button hole on the other, and I hot glued the bottle cap in the center of the piece of fabric. Then just put it around your wrist, and button the button! These are adorable I am going to try it with tiny villages! So adorable....cute gifts for the girlfriends! First time her by way of Everything Etsy! Thank You very much, your tutorial is lovely!!! Love it!! I just made one and it is so cute!! Thanks so much! these pincushions are just absolutely adorable!! i love your blog too! Absolutely adorable! Deff will have to try this out. I had a go at these myself. Thanks for the inspiration! Really simple and beautiful! I love it! I did one for me! I've had this tutorial bookmarked for ages (years, to be honest) and finally got around to making one. So cute!! I love how it turned out. You can see it here. The one thing I might add next time is something in the lid to give it a bit of weight. I always find cute and useful things/tips/tutorials in your blog. Adorei a idéia e o colorido.Parabéns.